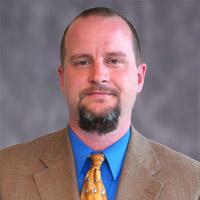 ECE Associate Professor Alan Doolittle and his students have been chosen for the 2010 NAMBE Best Student Abstract Award. W. Alan Doolittle and his Ph.D. students Jordan Greenlee and Laws Calley have been chosen for the honor of Best Student Abstract for the 27th North American American Molecular Beam Epitaxy Conference. The team will present their paper at the conference, which will be held September 26-29, 2010 in Breckenridge, Colo. Entitled "MBE Growth of Metal Oxides for Complementary Memristive Applications," this paper details the manufacturing methods for a new electronic device that demonstrates for the first time both complementary (both n-type and p-type conduction) memristors, a technology similar in nature to CMOS silicon and the first demonstration of analog memristors. These advances may be useful in next generation neuromorphic computers, which are computing technologies that mimic mammal brain functionality. In addition, Georgia Tech recently filed a patent on this technology. Dr. Doolittle is an alumnus of Georgia Tech, graduating with his B.E.E. in 1989 and Ph.D. in 1996. Before joining the academic faculty of the School of Electrical and Computer Engineering in 2001, he worked with the School as a research engineer. He is a member of the microsystems technical interest group.